makizavellihttp://makizavelli.comMy name is Adam Zavell, aka Maki Zavelli. I am a chef, artist and food blogger. 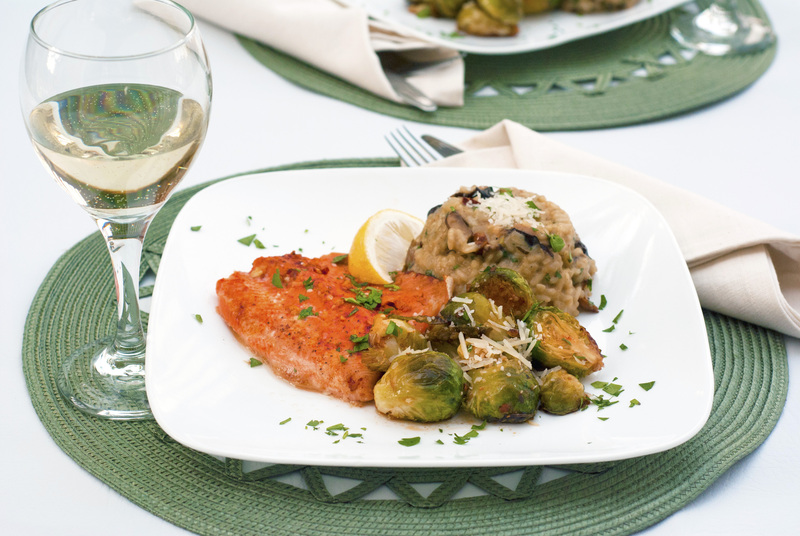 I love to share my passion for colorful, creative, healthful dishes and seafood sustainability concerns. Welcome to my waters! What’s that on the horizon there? I’ve been lost at sea for a while… um…hmm has it really been… uh 4 years?! I’m sure you never thought I’d return. I’m sure I never thought I would either. But alas, here I am, finally re-surfacing after all this time. Well maybe, or at least, temporarily. I haven’t changed a bit have I? Actually, no I’ve changed so much, it’s kind of ridiculous. You see, life has been kind of up and down for a while. Well not so much up and down, as it has been back and forth. I’ve spent my 20s really trying to figure myself out and just learn as many things as possible, and create! I love creating things. If there’s one thing I’ve learned overall is that it doesn’t really matter what it is, at the end of the day I just love to create. Early in my 20s I wanted to be a chef. I started this blog. I loved it. It loved me. It was a beautiful thing. It was a lot of work. It was a lot of work. I thought maybe the timing wasn’t right; it shouldn’t be this hard, should it? It ended quite abruptly when I picked up and moved to a new area with no plan, friends, money, or resources. Boy was that ever silly. I mean I learned so much and grew so much, but it sucked the momentum out of my sails in regards to the food blog. I never even had food in my fridge, let alone have amazing food to experiment with and photograph. Maybe that’s why most food bloggers are bored housewives. I dared to be different, but couldn’t keep afloat and so I abandoned ship. After finding out that working at a portrait studio was actually hell on earth, I landed back in the restaurant industry after a few months of a private chef gig. All along, I wasn’t focusing on food, it was just holding me over until I could make my plunge as a professional artist. It started creeping back in. Like a slow trickle, barely making itself known, but it was there. As I fell into a position that required the utmost confidence, and the ability to create constantly, I soon found that my passion for food didn’t die — no, it just got buried underneath a sea of self-doubt. Now I’m a chef, and my job is crazy and interesting. More on that later. I have no idea who is going to read this. I shipwrecked myself on a deserted island for ages while my readers all went on with their lives. I’m sorry I left, and I’m sorry this post is long. I actually have more important matters to discuss, but alas, I must leave this hanging on a cliff. 4 years is a long time. I never thought I would come back to this blog, but I’ve secretly always wanted to. It’s amazing to think of what could’ve been. Instead of looking back though, its important to keep moving forward. Now if only I could remember my old send-off…over and out … you ol’ … rainbow trout? I’d like to apologize for neglecting my blog this past week, and for not posting anything sushi-related in a while. I promise there is reason for that. Right now, as I am transitioning to a new place in life, everything is a little hectic and displaced. I had job interviews and meetings all week which all seemed promising. As I get ready to move, I reflect back on the fond food memories I’ve had here for the last 4 years, and there is one in particular that sticks out. Bowling Green is a college town. 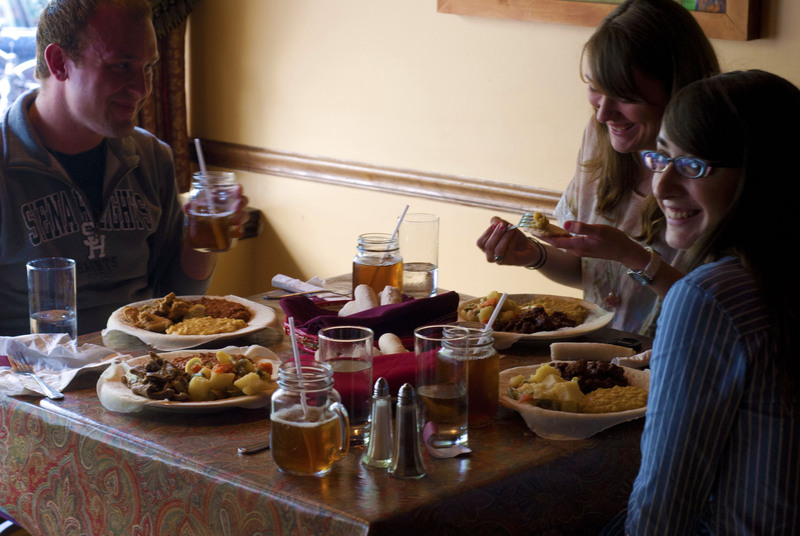 It is not exactly a foodie town, though there are a few gems known to the locals. While Myles Pizza is quite possibly the best pizza I have ever had, South Side 6 is the most surprising food location (with amazing gyros) that I’ve ever seen, and Cookie Jar is just plain heaven, my fondest food memory actually stems from a dish that I made in our little dumpy kitchen over a year ago. I don’t normally like to toot my own horn, but these lamb chops were the best that I ever ate, and probably will ever eat. It was actually the first time I have ever tried to cook lamb chops, and have since tried to re-create them several times, all without being as successful. My roommate and I experienced about 6 food-gasms that night. Out loud. And our mouths got fatigued from how good it tasted. As I am getting ready to say bye-bye to BG, I wanted to re-create those lovely little chops with a little more finesse. When I originally made these, I made a creamy, rich sunchoke puree to go with them. Sunchokes, also known as Jerusalem artichokes, are little tubers similar to potatoes, but with a bright nutty flavor. 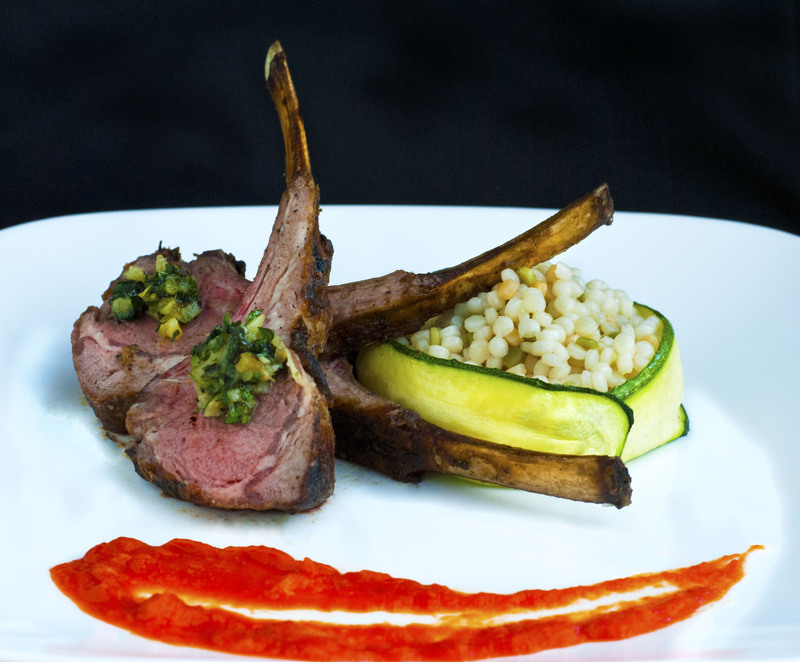 This time I used them in a puree that serves as a sauce, and chose Israeli pearl couscous as the starch instead, which pairs beautifully with lamb. The first thing I do is roast 2 heads of garlic. I cut off the tops, drizzle with olive oil, add salt and pepper, wrap in tin foil, and roast at 350 degrees for at least 15 minutes. I also roast the sunchokes at this time. You can peel them before or after. I like to peel them before because it’s less messy, but it’s also a little more work since they are small in size. Come to think of it, since the sauce was pureed, you could probably just leave the skins on and strain them out of the sauce. After the garlic is cool enough to handle, I make a paste in a mortar and pestle with salt and butter. I use this to baste the lamb throughout the cooking process, but do not use all of it for this purpose. The cooking is best suited to a grill, but since I don’t have one, I just use a cast iron skillet and the oven. If you try these on the grill, it may be a good idea to cook the chops separately instead of the whole rack at once. I season the lamb with salt, pepper, cumin, and coriander, and then sear on a hot cast iron. After a nice crust has formed, I brush it with the garlic butter paste, and add it to a 400 degree oven. The lamb will take about 12 minutes, adding more of the butter and basting every 3 minutes. 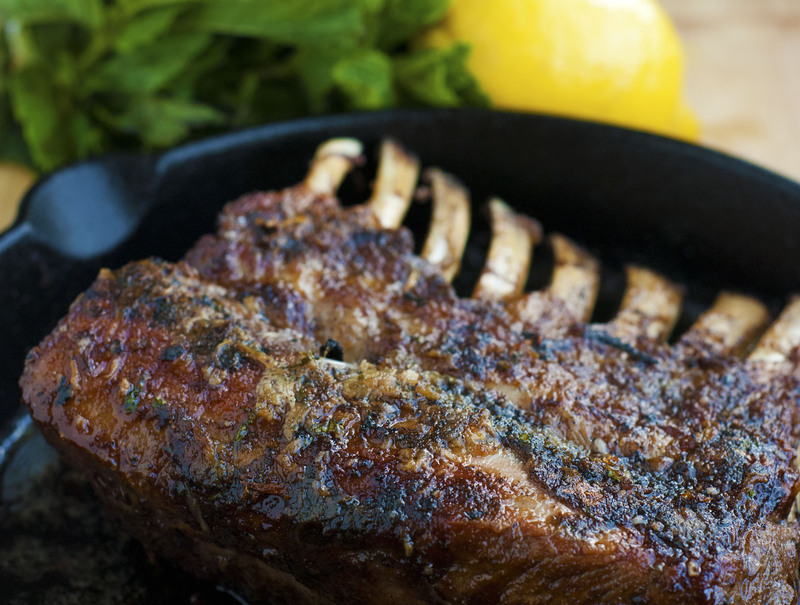 Make sure to let the rack of lamb rest for at least 10 minutes to retain its juices. It needs beauty rest. To make the sauce, I combined roasted red peppers, roasted sunchokes, roasted garlic, salt, lemon juice, cumin, and coriander in a blender. This mixture should yield a smooth, velvety sauce (unless your blender is being uncooperative like mine). Make sure to taste, and adjust ratios accordingly. To make the gremolata that tops off the lamb, you just add chopped fresh mint to the reserved garlic paste, and add lemon zest. To cook the pearl couscous, you could follow the box directions, but I found another way to cook these. Instead of letting them absorb all the cooking liquid like regular couscous, I cook these in a lot of salted water like pasta, and then drain off the water when they are cooked. Rinse them gently with cold water. They take about 10-12 minutes. The zucchini ring is cooked very simply. Shave a thin slice of zucchini using a cheese peeler or mandolin, and cook in a lightly greased pan. Alternatively, these might be great grilled, but I think you would need thicker slices. This was the closest I have come to re-creating that wonderful food memory. Everything was really delicious and paired well together. Now that I am ready to say goodbye to the last four years of my life, I am ready to welcome new challenges, ventures, and lots and lots of sushi. May the fish be with you, young rainbow trout! When I say “pudding”, I know what you are thinking, but no this is not a jell-o snak pak. 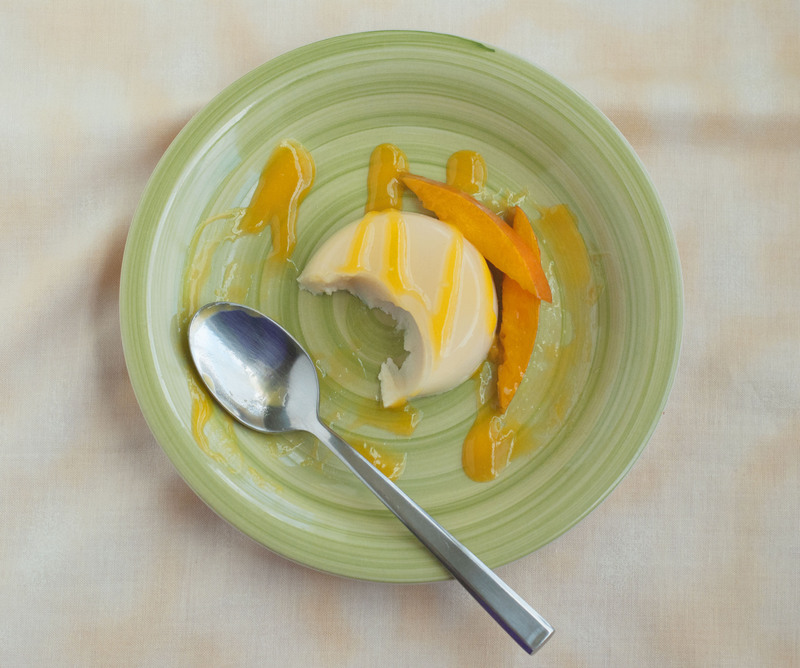 This version of pudding is a more general term to refer to a gelatinous east Asian dessert usually made with coconut milk and exotic fruits. 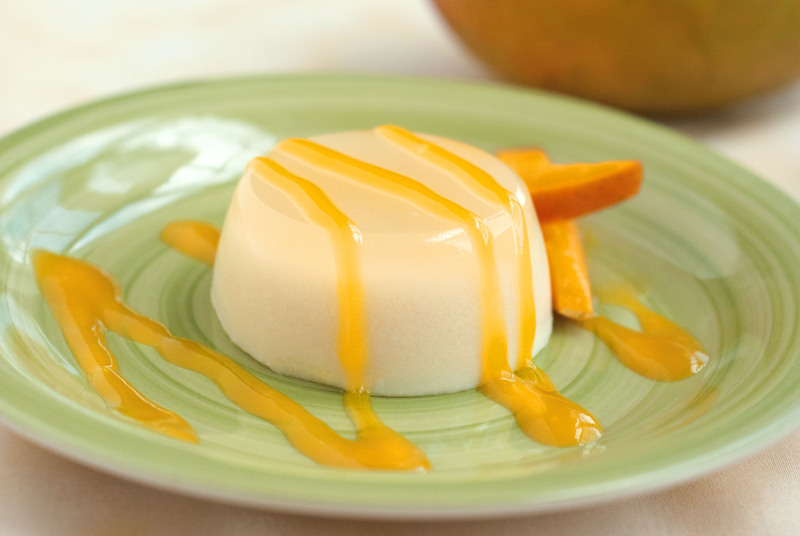 In terms of its texture, it is more similar to a flan or panna cotta than a pudding as we typically think of it. We had these amazing little puddings called sapin-sapin from one of the markets we went to at the Asian Festival, and they reminded me of a recipe I had in an Asian cookbook. The recipe showed lychees being used as a garnish, and as strange as it my seem, I had a can of lychees in my pantry that I needed to use. This little dessert was originally going to be mango puddings served with lychee, but the mango version had a really odd taste, and the texture of the lychees was also quite odd. So I decided to try again and reverse the situation this time. The results were far better, especially with the mango sauce I created to drizzle on top. Heat the coconut milk with the sugar until sugar has dissolved. Add the gelatine and stir until dissolved. Beat the egg yolk with the lychee puree and add mixture to the coconut milk. Stir until smooth. Spoon the mixture into lightly greased molds and leave to cool. To make the drizzle, heat the mango puree with about 1/4 cup of sugar. If its too thick, add some water. If it gets too thin, add more sugar. It should have the consistency of syrup. 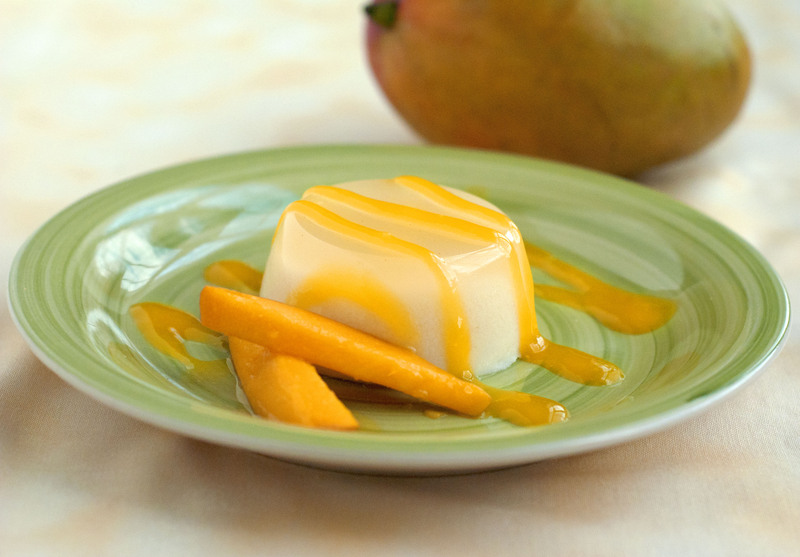 Take the puddings out of the molds, drizzle with the mango syrup, and serve with mango slices or chunks if desired. 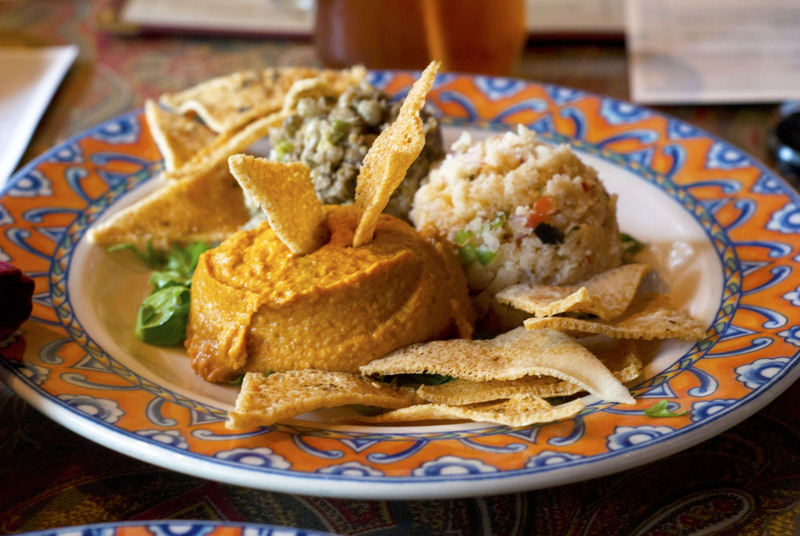 These exotic delights are a refreshing end to meal. They are luscious, sweet, and best of all; dairy-free. It is a light dessert that is also satisfying. First and foremost, let me get one thing straight. 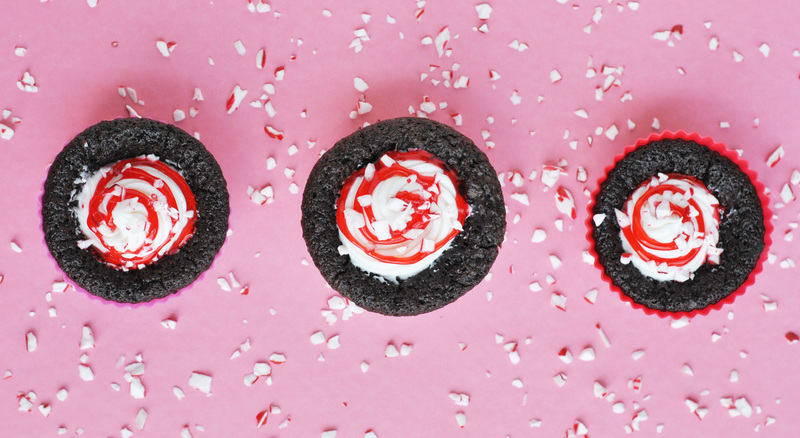 This is the one and only time you will see me do a cupcake post. I apologize in advance, as this post may get lengthy. These cakes have a lot of history. 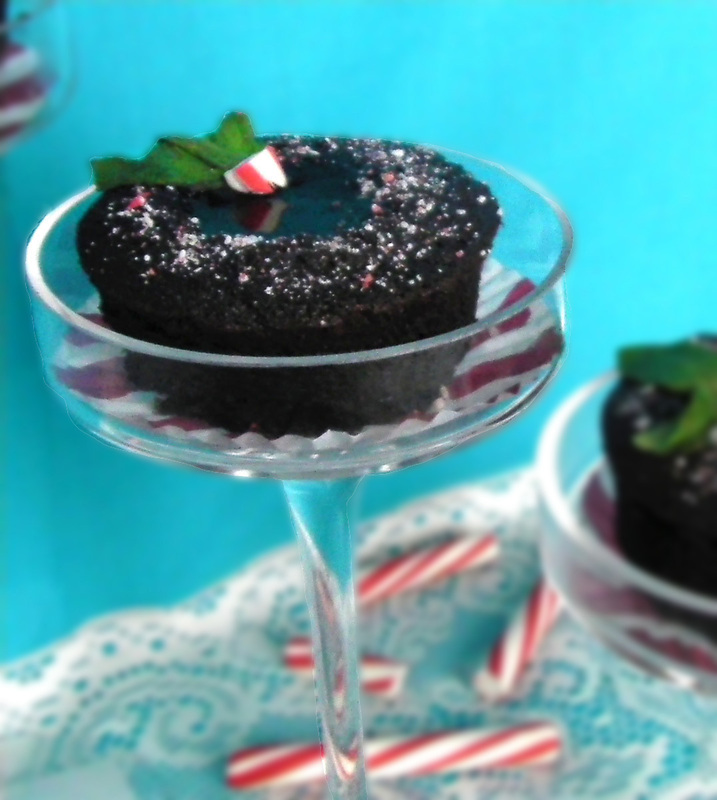 My friend Lauren has been bugging me to make these dark chocolate peppermint lava cakes for her ever since she first saw them over a year ago. This year for her birthday, I finally made it happen. Hence the new cupcake makeover. 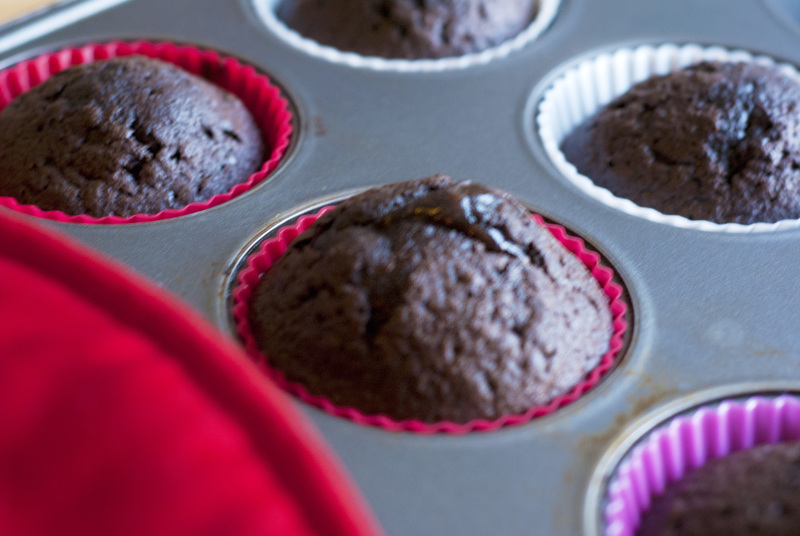 Add wet ingredients, including chocolate and butter to the dry ingredients and mix until incorporated and batter is smooth. You can most certainly just start eating here. No shame. 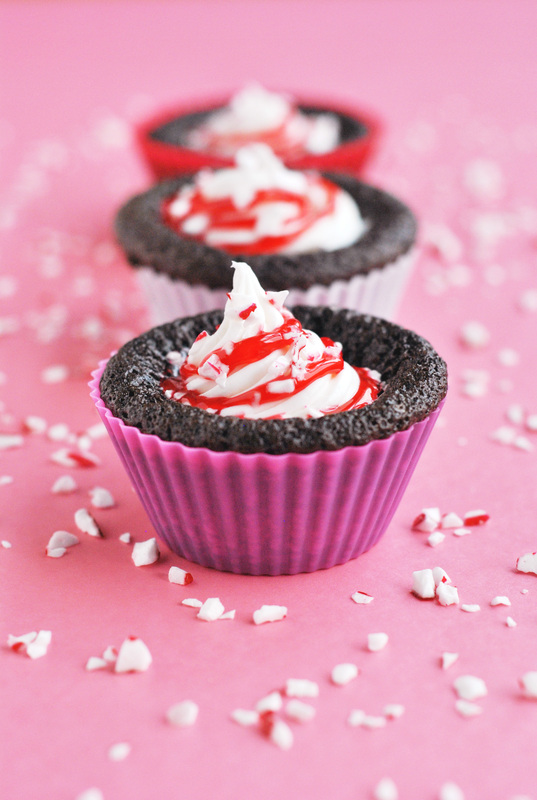 Grease ramekins (if you intend to remove them), or use a cupcake pan with liners. Ramekins will make bigger cakes; fill until batter almost reaches the top of the rim. Bake on 350 for 10 minutes (oven times may vary). You want to wait until the tops just set. 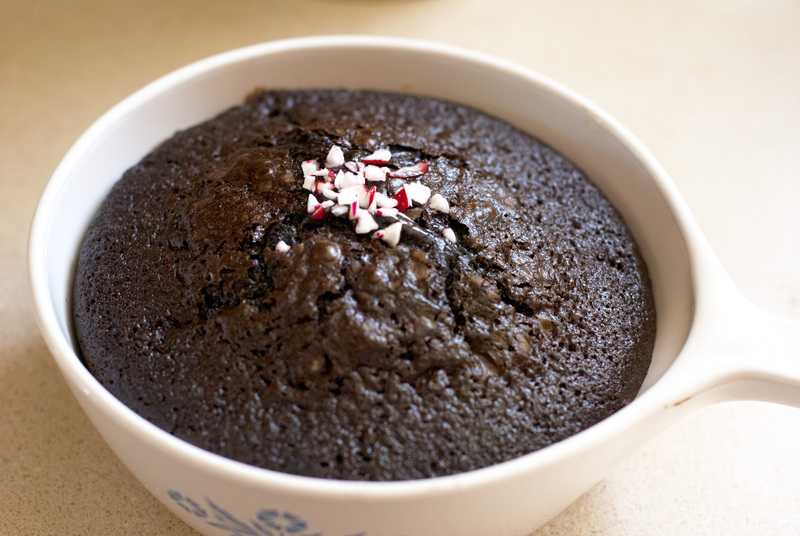 Much longer and you will have regular chocolate cakes (also delicious), and any less and you will end up with gooey sink holes (still delicious). Allow at least 5 minutes to cool. As you can see, I have served them a variety of ways… and eaten way too many of them. 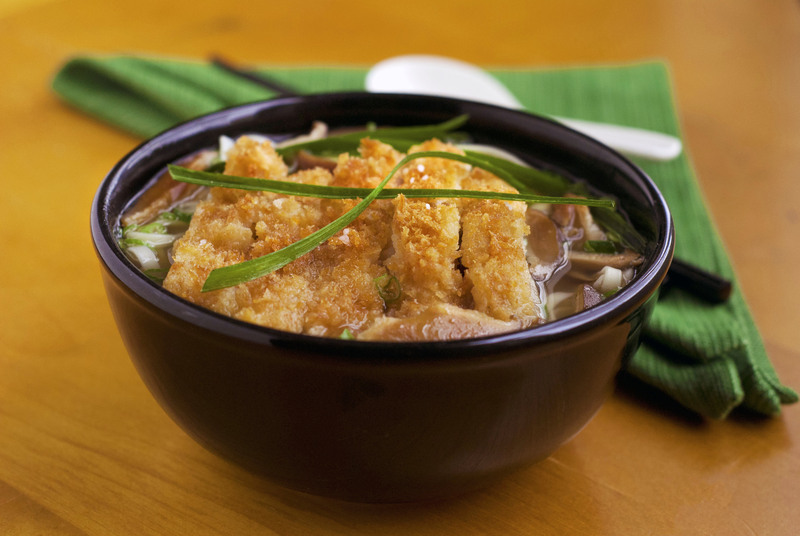 Recipe for katsu chicken udon noodle soup (pictured above) is at the end of post. A few weeks ago, the significant other and I took a trip to Cleveland. I was beginning my search for a new job and a new home. 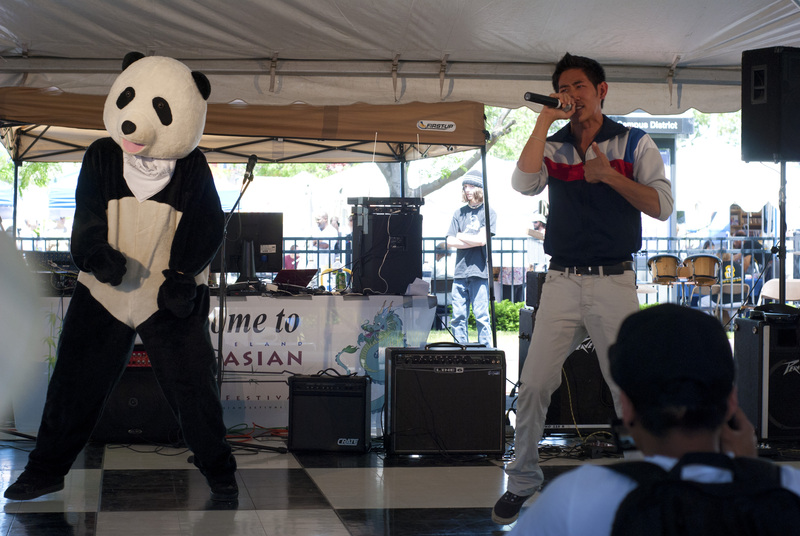 We also wanted to attend the 3rd annual Asian Festival that was going on that weekend. One of the dance crews from a recent season of America’s Best Dance Crew was there to perform, and being a huge fan of the show and of hip hop dance in general, I really wanted to go see them. Of course I wanted to sample all the tasty Asian food the vendors had to offer as well. 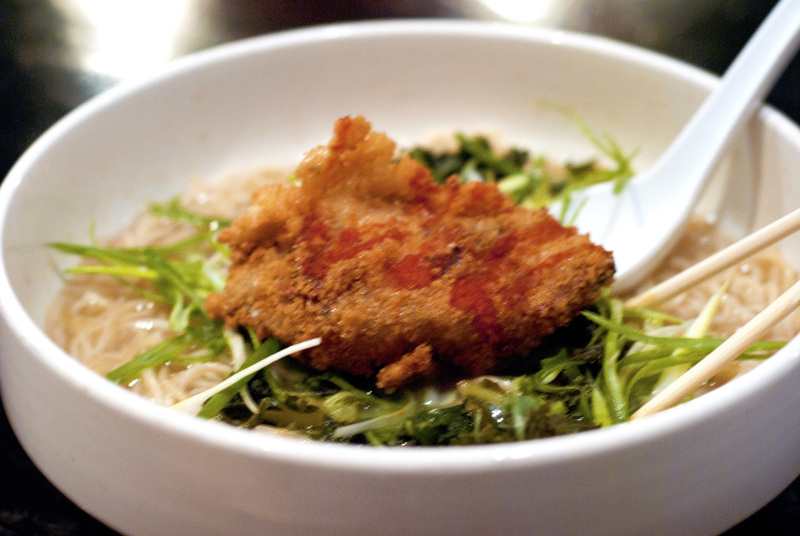 Our first night in Cleveland, we ended up checking out a hoppin new modern-concept noodle house, called Noodle Cat. My brother had mentioned this place a few weeks before and suggested I may try to get a job there. I think I liked this place so much though, that I would rather hang out and eat there than work at it. This place was pretty much designed for me. They serve real Japanese-style ramen, not to be confused with the dried instant kind (or the dance crew I am about to talk about). They also have other types of noodle soups and noodle stir-frys, and these awesome steamed buns that we tried. The menu is very whimsical as is the design of the place. The prices are also low, which means I can afford to go there often. There were two menu items that stood out to me for sheer odd-factor, and I asked the waitress which of the two she recommended and she pushed me in the direction of their “Roscoe’s Chicken and Ramen”. The dish sounded so crazy that I had to try it. For those of you who don’t know, there is a place called Roscoe’s Chicken and Waffles, serving that ubiquitous odd couple which I highlighted a few weeks in a post. We also walked around the city and checked out the new Horseshoe casino. While this dish was delicious, I couldn’t help but think they were trying too hard to be creative. Because the ramen was served separately from the chicken, it just seemed a bit too disjointed. And since the chicken was served on the bone, adding it to the soup didn’t really remedy the situation at all. The following day, we checked out Cleveland’s famous West Side Market, as well as the downtown aquarium. We ate at a little Cambodian place next to the West Side Market, which was pretty good. 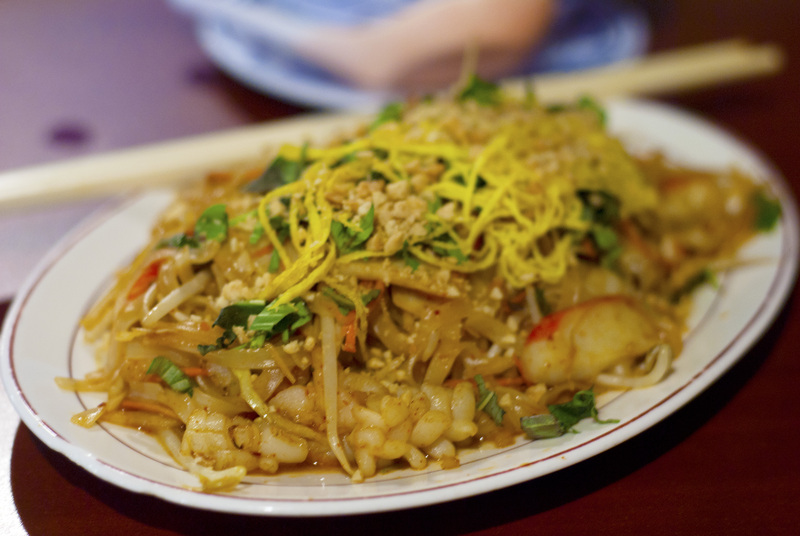 Cambodian food is somewhere between Thai and Vietnamese food. We got a noodle stir-fry similar to a pad thai, and a curry dish that my significant other really loved. I must say I really appreciated the name of this place too. Although Phnom Penh is actually the capital of Cambodia, it’s super fun to say if you are a foodie. “Let’s go get some grub at the Nom Pen!” See what I mean? We spent the rest of the day at my Dad’s in a nearby suburb. The day after, it was time for the Asian Festival. It started at 11, and we got there a little earlier which was great because we didn’t have any trouble with parking. 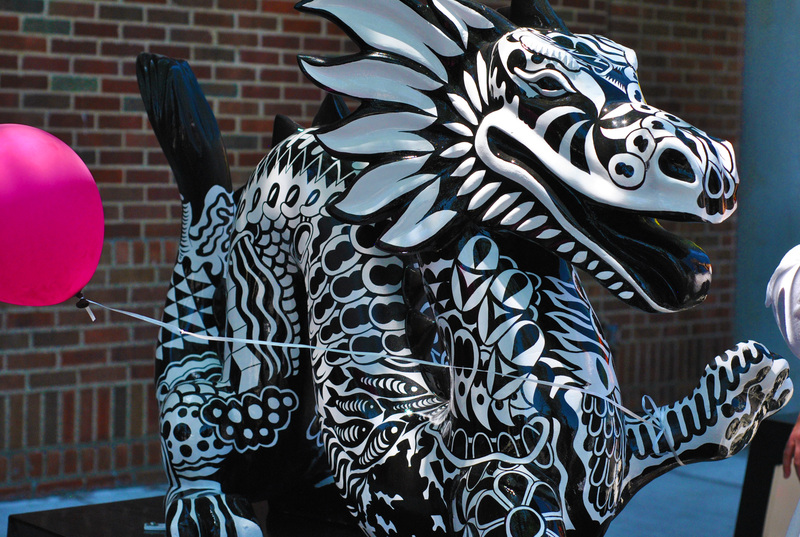 The festival was held in Cleveland’s Asiatown district, and this was my first visit there. We started our adventure at the Asia Town Center, which was like a mall with an Asian market and restaurants inside. The market was huge! I was in heaven here. We stocked up on mochi, and some really curious-sounding drinks, and made way for the festival. We later found 2 more markets just as big as this one! I can’t wait to live near here and have access to all the Asian ingredients that are commonly used in my dishes. It was really, really hot this day. Which was kind of unfortunate, because all of the hot food the vendors were selling was that much less enticing. We tried a few things, but nothing that really stood out. It was great to see that there wasn’t inflation like most festivals though. All of the prices were reasonable. We checked out some of the early entertainment such as this Chinese-American rapper who I thought was super awesome. We walked around some more and discovered Asia Plaza, which actually didn’t have a market. It was mostly non-food related stores. There was one dim sum restaurant there, Li Wah, but it was supremely crowded due to the festival. We went to another market and bought tons of curious candies and anything purple yam flavored that i could get my hands on. I even found real fresh purple yams! The significant other kept picking out things to put in a Chopped basket for me, and oh boy was there some scary stuff. 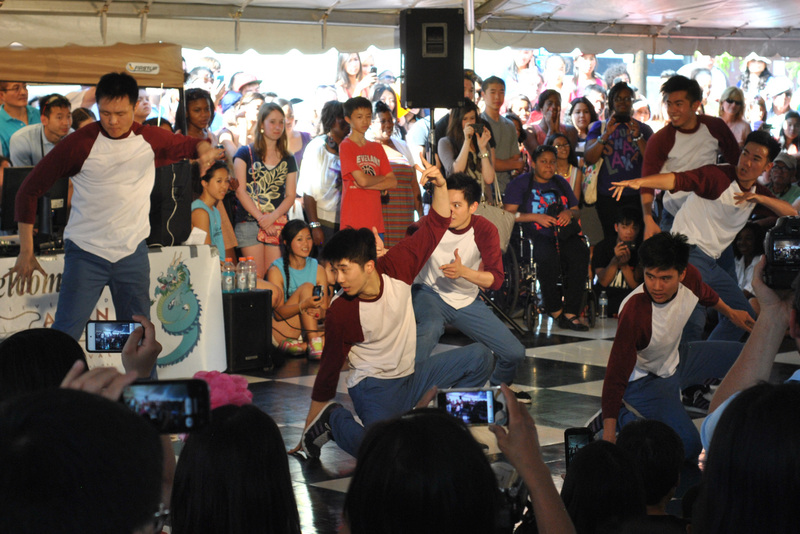 After snacking on gratuitous amounts of mochi, we returned to the stage area to check out the performance of Instant Noodles from ABDC. Oh Chuck, you’re my favorite noodle. I had a blast watching these guys. They are Instant Noodles, an all Taiwanese b-boy crew from season 6 of MTV’s America’s Best Dance Crew, who made it about half-way through the competition. Their motto is “we will serve you in 3 minutes or less”! 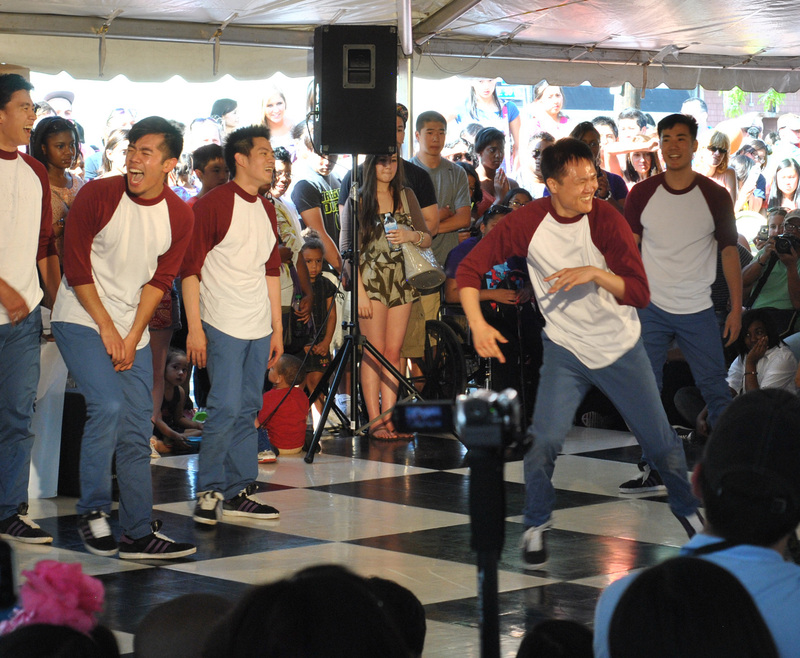 Although they did mostly b-boy freestyle solos, and not a whole lot of choreography, it was definitely worth watching. I have to commend them for dancing in that crazy heat. I also have to commend the winner of the audience member dance-off. I gotta give mad props to the cute little Asian girl in the green dress! She totally deserved the Instant Noodles t-shirt. Later that night, we went to a brand-new Vietnamese restaurant, which I also applied at. The food was good, but I think we had kind of overloaded on Asian food at that point. Yes that can even happen to me. But that didn’t stop me from re-creating that chicken and ramen dish I had at Noodle Cat when I returned to my townhouse a few days later. I wanted to make the dish with a bit more refined sensibility, so I went with a more traditional approach. I used dried udon noodles that I bought at one of the Asian markets, and I fried chicken thighs which I cut up and layered on top. It is common to be served a tempura element in an udon soup in Japan. I don’t think I ever saw it in ramen though. Not that ramen and udon are all that different. Prepare shiitake mushrooms: soak in water overnight or for at least an hour. Remove stems, slice thin, and sauté with teriyaki sauce. Cook noodles according to package directions, and set aside. Prepare chicken katsu: Bread chicken thighs with seasoned flour, tempura batter, and panko crumbs. Deep-fry until golden brown and cooked through. About 5 minutes at 350 degrees should do the trick. Alternatively you could use grilled or broiled chicken thighs or breast. Prepare chicken dashi broth: Bring 2 cups of chicken stock and 1 cup of water to a boil. Add a handful of katsuobushi (dried bonito flakes) and konbu kelp. You could also use hondashi powder instead. If you can’t find any of these ingredients, consider using a fish stock instead of chicken stock. I also add about 1 tbsp each of fish sauce, mirin, and rice vinegar for added depth of flavor. Reduce heat after it boils, and simmer for about 5 minutes, before straining out the solids. 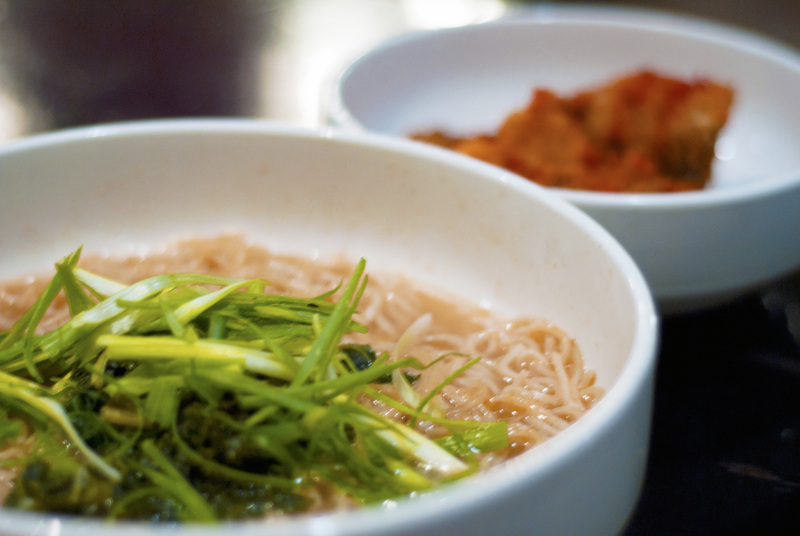 The easiest way to serve this is to put the noodles, green onions, and mushrooms in bowls, and then ladle the hot broth over top. 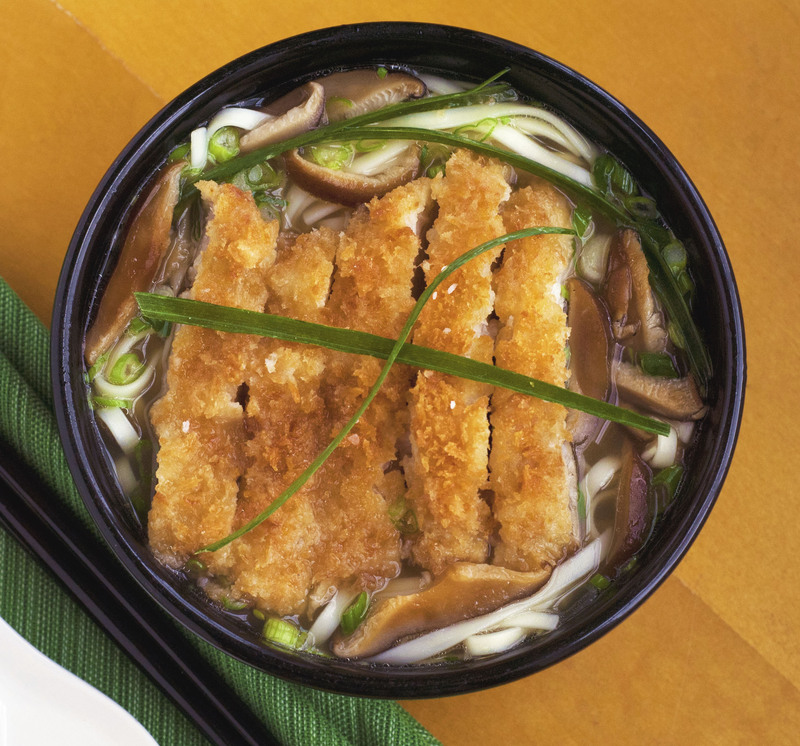 Add the sliced chicken katsu and garnish with more green onions. This date night dinner was inspired by my dinner guest, my significant other. This dish came about for several reasons. My date had never tried risotto, and loves mushrooms. There are two really good ways to prepare Brussels sprouts. And boiling them sure as hell isn’t one of them. This is the main reason that they have gotten a bad rap over the years. Parents mindlessly boiling Brussels sprouts and torturing their kids with them; well of course they aren’t going to like them. Maybe if you roasted them or caramelized them, or heck even did both, they might like them. 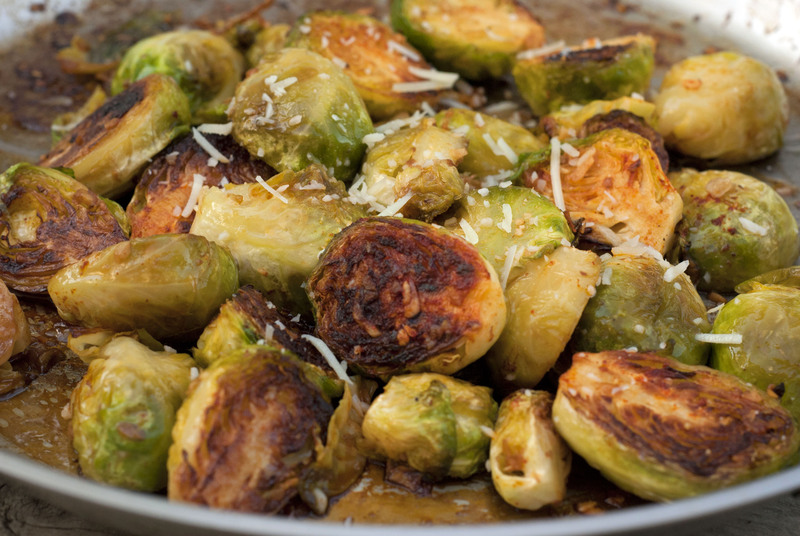 These Brussels sprouts are caramelized and roasted. They are also mighty fine, I might add. This risotto was creamy, yet firm, with a nice salty, earthy flavor. It may have been the best risotto I’ve ever had, and certainly the best I’ve ever made. I do have a horror story about arguably the worst thing I’ve ever made, which was a beet risotto. Dried mushrooms need to soak in warm water for at least an hour, and you need to remove the stems before slicing them thin. 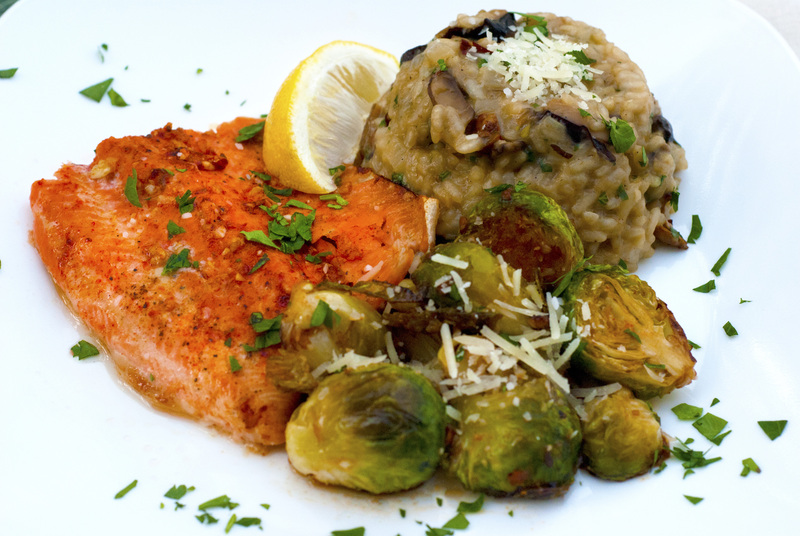 The risotto is the most difficult and labor-intensive component, so I would suggest cooking the fish and sprouts first and keeping them warm in a low oven. Pre-heat oven to 350 degrees. On a baking sheet lined with foil, season the rainbow trout filet with salt, pepper, smoked paprika, lemon juice, and olive oil. Heat oil in a pan over medium-high and add Brussels sprouts. Season with salt, pepper, and garlic. Cook for about 7 minutes without tossing or moving them around so that they can develop a nice golden brown color. Deglaze with some white wine, and then put it on the lower rack in the oven. Put the rainbow trout on the upper rack. Cook for about 12 minutes or until fishy is pink and flaky, and sprouts are tender. Meanwhile bring the chicken stock to a boil, and keep on a simmer. Heat oil in a saute pan. Cook mushrooms for about 5 minutes with some of the garlic. Then remove the mushrooms and keep aside. Add some butter, and the onions. After the onions have softened and become more translucent, reduce the heat, and add the arborio rice. Cook, stirring constantly for about 3 minutes or until the grains become more translucent. Add about 1/4 cup of the white wine, continue stirring until reduced. The technique for cooking risotto is to add a ladle full of hot stock and stir the rice until the stock is absorbed, and then add another ladle full and continue until all the stock is absorbed. This process takes about 20 minutes and requires vigilance, so an extra set of hands can be really appreciated when cooking risotto. This will give the risotto a natural creaminess. My tip for knowing when to add more stock is to spread the rice and expose the bottom of the pot; if liquid doesn’t pool in this spot and quickly fill back up, then you are ready to add more stock. When this is done, add the mushrooms back in, add about 3/4 cups parmesan cheese, and season with salt and pepper to taste. Remove from heat and add the chopped parsley. Garnish with more cheese and parsley. 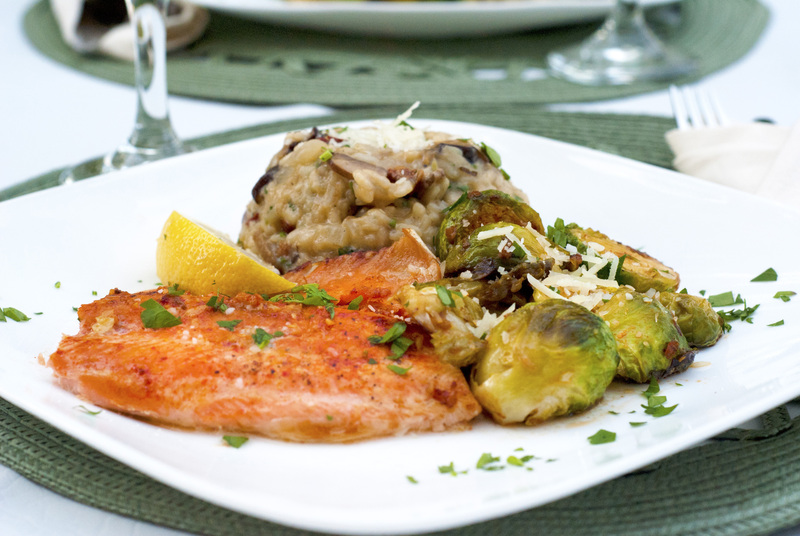 Serve with the rainbow trout and Brussels sprouts, and don’t forget the wine! Looking at these pictures now, I really want to have this dinner again. *sigh* Everything was truly splendiferous. My best friend and I have been talking about going to an Ethiopian restaurant for a few years now. I had often exclaimed about how it was one of the most amazing ethnic foods I had ever tried, and she really wanted to try it too. Problem is there isn’t one anywhere near us. As her graduation approached, I figured we should finally make the trek out to Ann Arbor, where the closest Ethiopian restaurant resides. The restaurant is called Blue Nile. Not to be confused with the West Nile, of course. 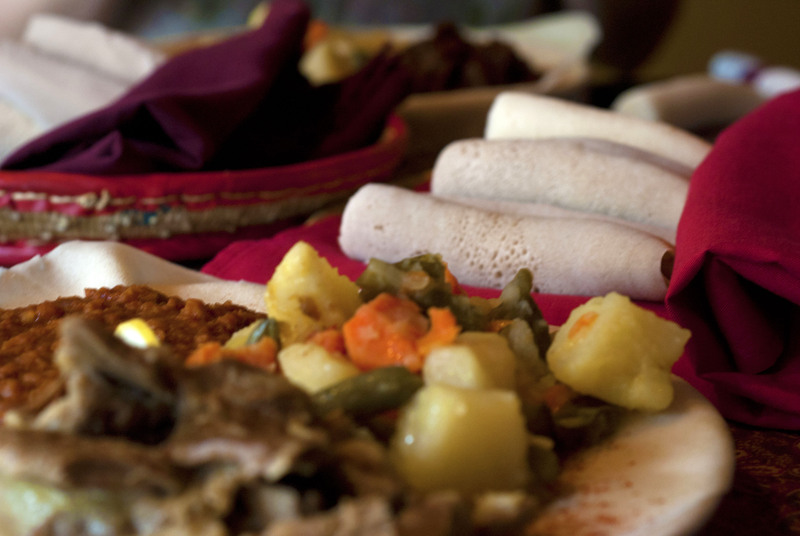 If you’ve never had Ethiopian food, well, you should probably change that. 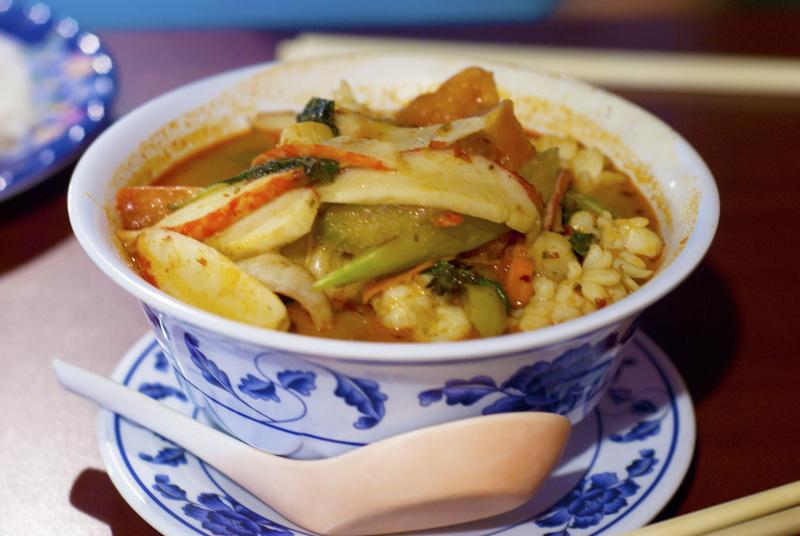 It is one of the most delicious, healthy, and interesting cuisines around. It centers around injera, which is a light airy bread which could only really be compared to a crepe. Instead of utensils, you generally just use injera to grab the various stewed meats and vegetables and eat with your hands. 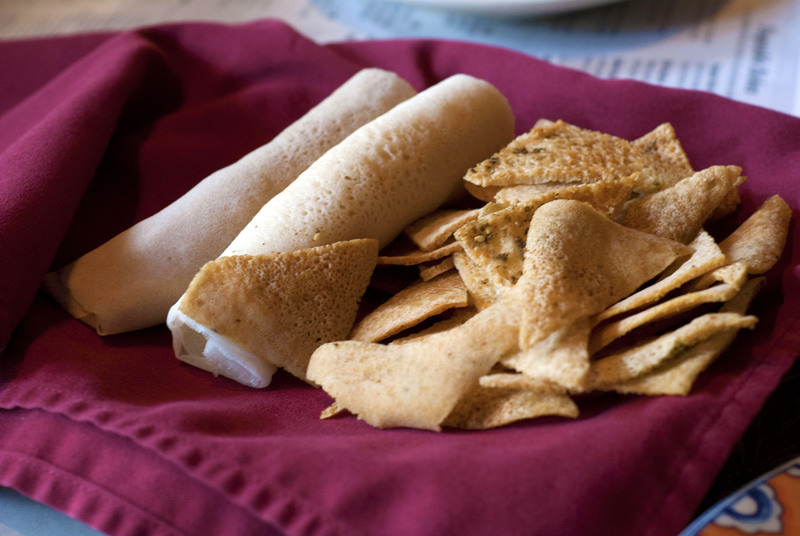 Injera can also be fried, and served like pita chips. Four of us went to the restaurant, and it was everyone’s (except me) first time with Ethiopian food. We ordered two appetizers, and we all ordered Ethiopian iced tea which resembled chai tea. I learned on that day, that it is never necessary to order appetizers at an Ethiopian restaurant. I am known for having a large appetite, but I was full to the point of moaning for hours after devouring every last bite on my plate. This was a trio of dips consisting of a hummus, azifa lentil salad, and timmatim salad. These were all super yummy served with both fried injera and soft injera. We also ordered what was called a begolo cake. I loved this appetizer and it was really interesting to see that African American cooking has roots in Ethiopian food. 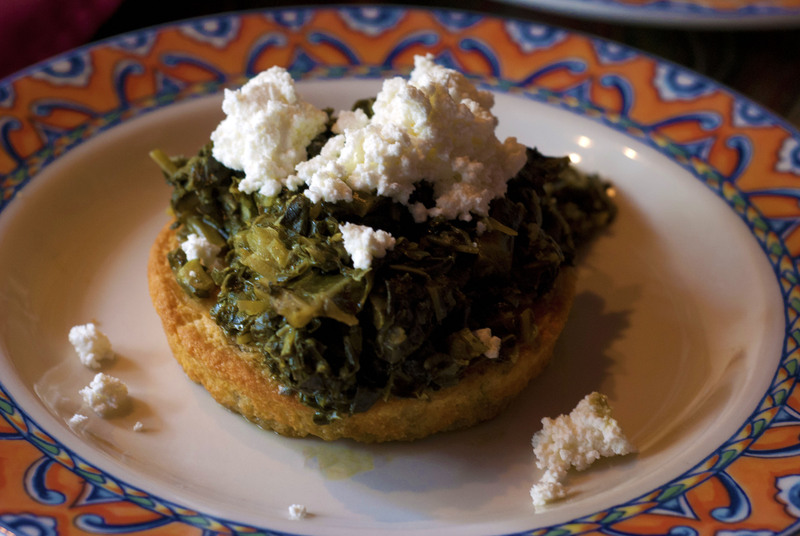 This was a corn cake served with stewed greens and a light cheese. It was crunchy, sweet, and satisfying. Each entree comes with a stewed meat of your choice, and two vegetable sides chosen from various options. 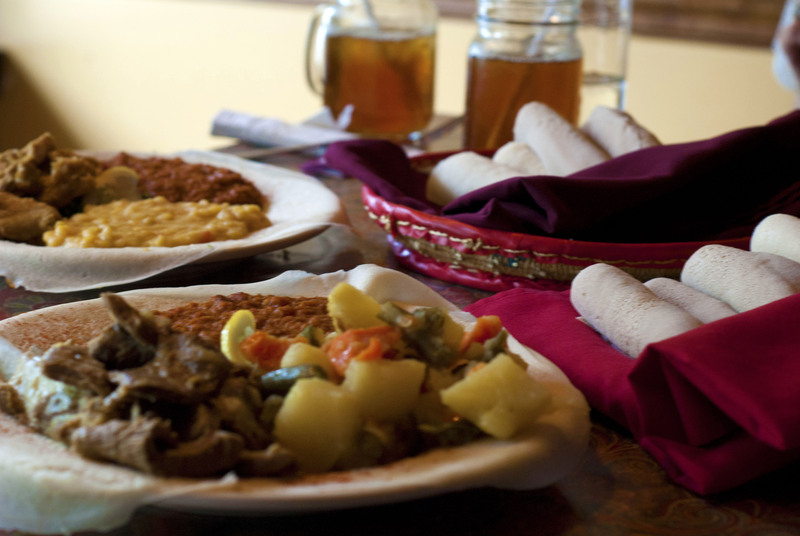 These three stews come served on a plate covered in injera bread. There are also vegetarian options. I ordered lamb dish called yebeg alecha, Abe got a chicken dish called doro wat, Nicky and Amber both ordered the beef zizil wat. Everything was great, and although maybe not as amazing as the first time I had it years ago in Cleveland at Empress Taytu, I have to give Blue Nile two big makizavellian thumbs up.